Can someone explain the "Bond Drama"
So I have a basic understanding of bonds and what they do but I'm not understanding the recent panic coupled with that I was watching Suzy Orman on a PBS fund drive and she was going on about how bad bond funds are? Seems to me that history shows, when things get a bit dicey, money flows toward bonds, not away, in the so-called "flight to safety", resulting in higher prices and lower rates. Rates will inevitably go up at some point, but it's unlikely to be rapid, or a "surprise". If you are a long term investor (hopefully you are), it's much ado about nothing. Joe buys a bond with a par value of $1,000, mature in four years paying a coupon rate of 4 percent annually. That means he'll receive $40 a year or $160 over the lifetime of the bond if he holds the bond until maturity. Anne holds off, because she thinks that interest rates will rise in the next few weeks. Sure enough a new bond is now offering a coupon rate of 5 percent, meaning that Anne will receive $50 dollars annually, if she decides to go ahead and purchase bonds now. Anne can either buy the new bond for $1,000 at 5 percent, or she can buy Joe's bond at a reduced price, because why would she pay $1,000 for a 4 percent coupon rate? She wouldn't, so she could purchase Joe's bond at a discount. In this example, Anne could purchase Joe's bond at a discounted rate of $965. As you would guess, if interest rates decreased to 2 percent and Joe wanted to sell his bond, his could sell at a premium or above par value. This is just another way to illustrate the inverse relationships between interest rates and bond prices, and remind you to consider the ups and downs before jumping into the bond market. BUT if Joe doesn't sell his bond, he loses lose nothing, as he continues to receive his $40 in annual income, and he gets all his cash back when the bond matures. So in that case, the decline in market value doesn’t make any difference. However, there are similarities and important differences in how bonds behave vs bond funds. You will find people who argue that bonds are a bad investment in the short run, but still a good investment in the long run. But there are few if any alternatives. Some people recommend dividend paying stocks to replace bonds, but that comes with an increase in risk & volatility, there's no guarantee dividend paying stocks will outperform bonds despite the current interest rate outlook. Just do a search on bond dilemma or bonds interest rates, etc. I clicked on this thread because I thought a new 007 movie was coming out SOO disappointed. PS I put Ms. Orman on par with Sponge Bob , and Jim Cramer. Entertaining at times. I trust Midpack far more than the talking heads on television. A market-value drop of 11% might seem pretty scary, but if you don’t sell your $10,000 bond, you will lose nothing, as you continue to enjoy your $400 in annual income, and you will get all your cash back when the bond matures. So in that case, the decline in market value doesn’t make any difference. I always liken bonds (and funds) to income property. The value of the house can go up or down depending on external forces but the rent keeps coming in. Hold on long enough and you'll be fine. I have a high yield fund that keeps on paying ~ 8% year after year. Bond funds have no set maturity date, so when rates rise the price goes down. Verses an actual bond that can go up and down but will return to par when maturing. I think this was Suzie Orman's point. Only temporarily. Look at the NAV for any intermediate bond fund over time. but the bond funds interest rises over time and a fixed bond's doesn't . at the end of the day there is little difference . Some bond funds are leveraged, and their NAV can get whacked when rates invert, or rise sharply. Some bond funds dip into and distribute principal to maintain a more consistent distribution, rather than paying out strictly 100% net income and having to drop the distribution if rates fall and their new bonds pay out less. Some bond funds end up with capital gains after selling their position, and they distribute the capital gain (thus reducing their NAV). Some bond funds have managers that might buy bonds at a premium to par to increase current cash flow (because they have a higher coupon), while taking a hit to NAV when that bond matures at less than par (and get less principal back to re-invest), thus reducing NAV long-term in sacrifice for short-term higher cash distributions. It's not a simple answer of "the bond fun will behave the same as any individual bond". Some bond managers work to maintain a consistent NAV. Some look to grow NAV. And others look for just high current income. The drama is angst over a likely rise in interest rates which will result in a decline in bond prices (and therefore bond fund prices) as Midpack explained. Another term that you will hear it referred to is "interest rate risk" which is that the value of bonds decline when interest rates rise and increase when interest rates fall. Since the Fed has signaled that it will increase interest rates when the economy is strong enough, the value of bonds will fall. For long term investors, it is no big deal as bonds bought with the proceeds from maturing bonds or new money at higher interest rates will eventually increase the portfolio yield and offset the decline in value, but there is an inevitable lag. 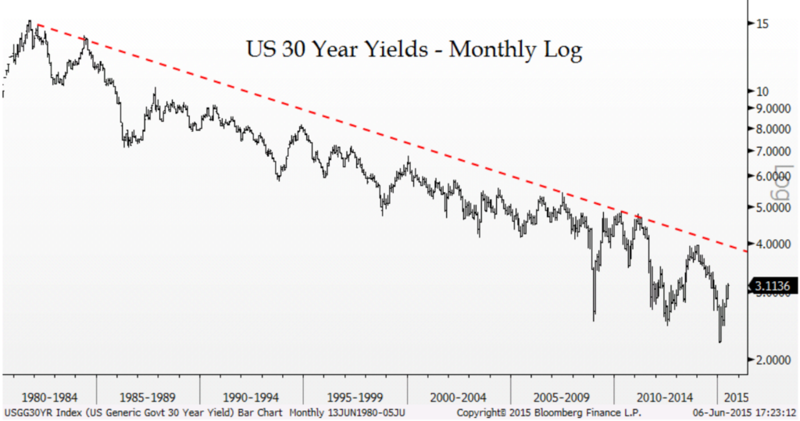 odds are you will always be behind the curve if rates normalize to historical averages as that can be decades. it took 40 years to get this low. in theory you should be whole again based on the duration of the fund . but bond funds have to many wild cards to even think that will play out matching duration values. credit ratings change as well bond funds adjust maturities as events play out. they may have 10 year mature but buy 5 year in defense which have a lower interest rate. all true , but my point is not the actual dollar amount but the fact you are really not any more protected buying individual bonds than bond funds. getting paid back decades from now in today's dollars is a loss of purchasing power the same as a bond fund would have a loss adjusting on the way. Since the Fed has signaled that it will increase interest rates when the economy is strong enough, the value of bonds will fall. Maybe, maybe not. The market sets the price of bonds, so it's impossible to say. One could argue this is all priced in already. Everybody said rates would go up when the Fed's bond buying program wound down in 2014. And everybody was wrong. Lesson for the long term investor: ignore the talking heads. Don't try to time the market. The early 1950s had 10yr treasury yields similar to today, stayed in a range and started trending up around 1968. From 68 - 81 PINCX lost about 40% of NAV and never recovered it. FBNDX is another with similar chart. we have not had one in my investing lifetime as the trend for almost 40 years has been down. that is why talking about what the past did is like driving and looking in the rear view mirror. if we did turn the corner , how we invested in the past may not be the best way anymore. And talking about what the future MIGHT bring is just guessing. which is why i believe in nudging things along the way to fit the big picture. Wow - I need some help with this post and would appreciate comments. It appears to me that PINCX had a value of $38,717 (relative to the 10,000 scale on Morningstar for 11/2/54) on 12/31/68 (a local maximum). It dropped to a local minimum on 6/20/70 of $28,068 (28% drop) and recovered to $40,256 by 3/3/72. By 6/30/79 it had risen to $61,404. My calculations show that's a compounded 4.5% gain over the 10.5 year period between 1 January '69 and 1 July '79. How am I misinterpreting these data?